OCTOBER 6TH marked the end of an era in American diplomatic history. 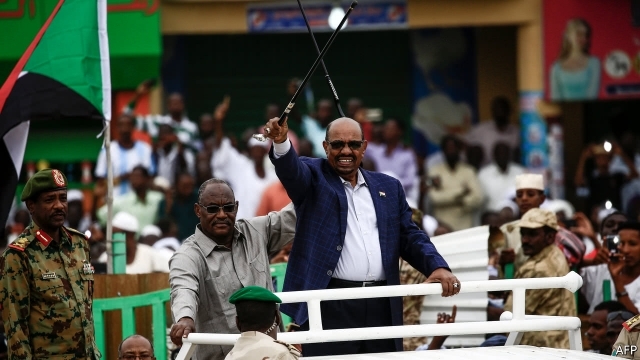 Twenty years after imposing sanctions on Sudan, it lifted them again. The sanctions included a fairly comprehensive trade embargo, a freeze on government assets, and tight restrictions on financial institutions dealing with Sudan. Bill Clinton had introduced them at a time when Khartoum, the Sudanese capital, still harboured terrorists, including Osama bin Laden, and they were extended in 2007 in response to the genocide taking place in Darfur, in the west. The reasons for the softening of America’s stance are not immediately obvious. Omar al-Bashir, the president since 1989, is wanted by the International Criminal Court on charges of orchestrating the Darfuri genocide. Travel bans and international asset freezes remain against those suspected of involvement in the genocide. Human-rights violations are still depressingly common across the country, peace has not yet returned to the mutinous south—and human-rights groups urged Washington to maintain sanctions. Why, then, are they being lifted? The situation in Sudan has improved. Relations with neighbouring countries are better, aid workers are now allowed to reach civilians wounded in conflict zones and greater efforts have been made to end the wars with southern rebels. The government also appears to have stopped meddling in neighbouring South Sudan (which has been locked in a bloody civil war since 2013). It has mostly ended its support for armed rebel groups there. But perhaps most important from Washington’s perspective is the regime’s co-operation in fighting terrorism. Gone are the days when Khartoum was a mecca for international jihadists. The CIA, which now has a large office in the capital, was especially keen to see sanctions lifted. Other countries have opened their arms to Sudan. First came China, which has invested in the oil sector since the early 2000s. Malaysia and India soon followed. More recently, Sudan started cosying up to Saudi Arabia and its Gulf allies, after expelling some Iranian diplomats in September 2014. It has sent hundreds of soldiers to fight with the Saudis against Iranian-backed Houthi rebels in Yemen. In return, Saudi Arabia and other friendly states deposited at least $2.1bn in Sudan’s central bank—a lifeline at a time when foreign banks had begun refusing to deal with the country. They also urged America to drop sanctions. Meanwhile, Sudan indicated its desire to improve its international standing by working with the European Union to reduce undocumented migration into Europe, clamping down on people-trafficking and improving border security in exchange for €100m in aid. By 2016 many in Washington had concluded that the embargo had achieved little beside making life tougher for ordinary Sudanese. In January 2017 Barack Obama announced a temporary easing of sanctions, with a review due in six months. The policy was part of a general Obama-era shift away from the use of economic embargoes as a diplomatic tool. Mr Obama engaged with Iran and Cuba in the hope that the promise of investment would strengthen reformist elements in both regimes. He also lifted sanctions against Myanmar. Donald Trump does not share such instincts. Sudan was one of six countries listed on the travel ban on Muslim-majority countries (though it has now been removed from the list), and he has imposed new sanctions on Iran, Cuba and Venezuela. In July Mr Trump delayed lifting Sudanese sanctions by four months. But he agreed to lift them permanently after the Sudanese government severed all ties with the North Korean government. (There is evidence to suggest that Sudan has tried to buy arms from North Korean in recent years.) Mr Bashir may be an alleged war criminal, but even he becomes an ally against Kim Jong Un and his regime.